S-5! clamps use round-point setscrews to firmly grip the seam of a roof without penetrating its panel material. Our clamping technology is so unique that it carries its own patent. Compare approaches: Copycat clamps use “cup-point” screws that cut through the paint and protective coating on roof panels, allowing corrosion to set in while voiding the warranty on the roof. But S-5! clamps come with our , round-point setscrews which are guaranteed not to puncture your panels or affect your roof’s warranty. We have done 1000 hour ASTM B-117 Salt Fog testing on S-5! system clamps, attaching them to painted Galvalume® and galvanized panels. The result: Zero corrosion. In addition, S-5! customers can rest assured that all our related hardware is noncorrosive, 300 series stainless, not plated steel. Our S-5! attachment method has been thoroughly tested for tenacity, and has proven itself unrivaled in the industry. 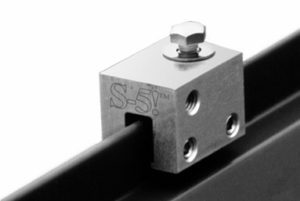 And since the holding strength of any clamp will vary across different roof profiles, material types and gages, S-5! performs hundreds of independent laboratory pull tests on every roofing type available, and we’ve posted the results for your review here. Yes! Contractors everywhere love the ease of assembly, the simplicity, and the durability of our S-5! snow retention systems. This should come as no surprise, because the S-5! systems were designed by a contractor who was tired of inferior products that were wretched to install and performed poorly. These systems were then field tested and refined in the Colorado Rocky Mountains where snow challenges are extreme. The result was a line of unsurpassed snow retention systems based on S-5! clamping technology. Yes—any product should be—including those sold by other companies. Everything has a failure point, which is why products are tested. The idea, then, is not to expose a product to forces which exceed its known point of failure. These forces are predictable and can be calculated accurately for any application. Ask your distributor for assistance or try our ColorGard® calculator. We have chosen examples from opposite ends of the spectrum for purposes of illustration. Most jobs will fall somewhere between. Your distributor can always assist with pricing individual projects. Our on-line calculator can assist with determination of quantities. If there is a design objective to color-match pre-painted steel or aluminum roof material, then ColorGard® is the obvious choice. If the project involves mill finish, traditional folded standing seam or batten seam copper, then brass SnoRail™ or SnoFence™ is the perfect solution. If the design calls for slender, cylindrical shapes, look at SnoRail or SnoFence in mill-finished aluminum. For projects with high snow loads and wide seam spacing, X-Gard™ 1.0 and 2.0 are the answer. When architectural specifications call for a 1″ pipe system, look no further than DualGard™. 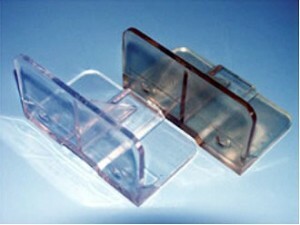 SnoClip, X-Clip, or DualClip will stop or retard the passage of snow and ice beneath the snow retention cross member. If other flashing elements (e.g., eave guttering accomplishes this purpose) are utilized, then it may not be necessary—so its use is somewhat discretionary, depending upon the eave details and project specifics. We recommend it in most cases. In general, one SnoClip per panel on the first row of snow retention will suffice. When seam spacing is >24″, two or more SnoClips per panel are recommended. The premium paint finishes used on metal panels are “coil-coated.” This paint application method utilizes state-of-the-art technologies, chemical pretreatment, primer and finish coat application, and controlled oven curing. Only through this lengthy process can high quality Kynar and Hylar (PVDF) finishes be applied and warranted against color fade for 20 years and longer. Our competitors have tried everything in their attempts to match the color and performance of factory coil-coating methods: Anodizing, powder coating, dye and air-dried paints—even powder coating with Kynar resin. But nothing ever comes close. Even when these methods produce perfect paint matches, the match doesn’t last. In a few short years the inferior paint on the snow guard reveals itself as it fades noticeably faster than the roof, creating an effect that is strikingly unattractive. Even powder coating with Kynar resin cannot equal the performance of coil-coated Kynar.